BullionStar's physical bullion vault is integrated into BullionStar's retail shop and showroom at 45 New Bridge Road, Singapore 059398. This vault is a high security steel bar reinforced concrete vault originally built for a Singaporean bank. By having the vault integrated with the BullionStar shop & showroom, BullionStar customers can deposit, audit and physically withdraw bullion in a matter of minutes with no prior appointment necessary. However, you do not have to be physically present in Singapore to buy, store or withdraw precious metals at BullionStar becasue everything can be handled with BullionStar's Vault Storage solution online. 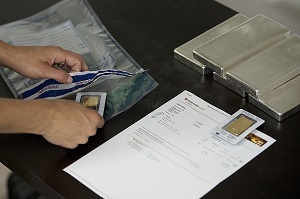 Purchase orders and bullion withdrawal orders can be shipped fully insured to most countries worldwide. Proceeds from sell orders can be transferred directly to your bank account, settled in cryptocurrencies, or kept as a cash balance in your BullionStar account to be used to make future purchases or to be withdrawn at anytime. Customer bullion is securely stored in BullionStar's precious metals vault which is integrated into the premises at Bullionstar's bullion shop and showroom at 45 New Bridge Road, Singapore 059398. This vault is an old style steel bar reinforced thick concrete vault that is extremely difficult to destruct. BullionStar's premises was at one time a bank branch of Overseas Union Bank (OUB), and the vault was constructed by OUB before OUB subsequently merged with United Overseas Bank (UOB) in the early 2000s. A 1 tonne vault door protects the vault entrance. The vault is further protected using seven different types of modern surveillance technologies. Having our vault integrated within the bullion shop and showroom facility provides our customers with the convenience of being able to buy, deposit, store, value, audit, sell and withdraw physical precious metals, all in one and the same location. BullionStar's combination of a secure integrated vault together with a modern and versatile transactional website and online user-interface provides our customers with a unique one-stop solution for buying, storing and selling investment precious metals in what is one of the safest and most business friendly countries in the world - Singapore. In addition to the physical security and advanced surveillance features of the vault, BullionStar implements all encompassing measures to protect your privacy and your data. In the extremely unlikely event that an adverse unforeseen event materialised, BullionStar is insured by a worldwide renowned insurance underwriter against all risks including fidelity and mysterious disappearance.